BPC models are often referred to as BPC applications and BPC environment is normally called Application. This model provides an option within host BW’s protected namespace “/CPMB/”. When you separate the BPC transaction data and master data inside the namespace (“/CPMB/”), all the sub-processes that are associated with standard model are closely secured, and only closely managed by the department running the app. This model is designed by SAP to provide a protected area for customers who to plan and consolidate in their own department without wanting to share or coordinate the resources with other Business Warehouse community users. As the code set of Standard model has been coordinated with version BPC 10.0 so all the changes to BPC 10.0 are shown in BPC 10.1 Standard model and changes to the version BPC 10.1 Standard model are shown in version BPC 10.0. This allows a code compatibility between BPC 10.0 and BPC 10.1, and clients can easily perform migrations while upgrading BPC version from 10.0 to 10.1 Standard Model. In short, you can say in Standard model, BPC environment contains the BPC applications or models and each model generates a BW InfoCube which is hidden. This model is different from Standard model and includes data access to all community users. For Embedded design model, initial versions used were SAP BW Integrated Planning and Planning Application Kit i.e. BW-IP and PAK. This model provides a different level of data access where master and transactional data from host EDW environment is accessible by the application. In Embedded model, it allows easy access to transactional and master data within the host BW, and this data is shared with many other users and controlled by the administrator group. In Embedded model, migration from older versions of Business Warehouse IP, BW-IP to this data model is relatively easy and migration from earlier versions like (BPC 10.0 and earlier) is considered as a new implementation. In short, you can say that in embedded model, any number of InfoProviders can be assigned to a single BPC model/application. An application in BPC is also known as a model, like an environment is called an AppSet. 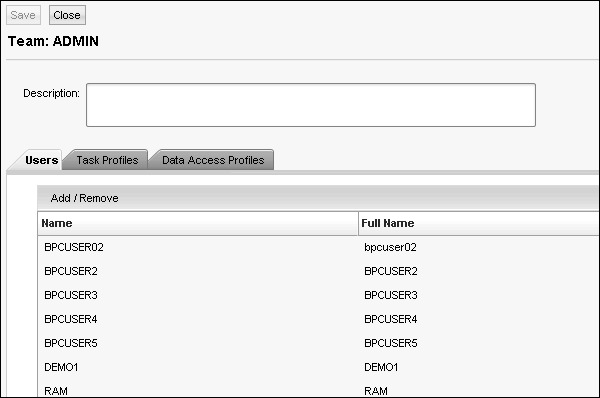 You can create an application by going to Admin console in Enterprise Performance Management (EPM) System. BPC environment or AppSet has the group of applications or models. All these applications share the planning dimensions and are linked with each other. As mentioned earlier, applications are called multidimensional data models in EPM. You can add a new application or also copy an existing application. Environment management includes setting up work status for applications and adding the business rules to the applications. Work status determines who can make changes to data or who can change the work state on the data set. In Environment management, you can also carry out applications optimization. When a new application is created, it contains only a small amount of data. As time passes, data in application increases and it is always recommended to perform application performance optimization in BPC environment. It is also possible to delete any application in BPC environment when required by going to admin console. You need to be an administrator to perform this function. 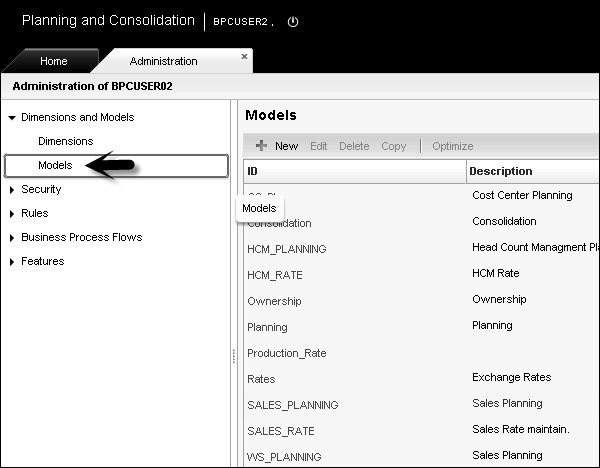 Dimension management in BPC includes creating new dimensions, defining members in dimensions, and assigning properties. Dimension contains member and there is a hierarchy between members that is defined like parent, child and sibling. You can create a new dimension by going to Admin Console → Dimension → New Dimension. Dimension name is not case sensitive and it should be unique. When adding a new dimension, you have to enter reference type. Planning and Consolidation checks the value of reference type while processing the dimension. Click Create button in the above window. You have to enter referential integrity for Rate type in the new window. Click ‘Save’ icon. 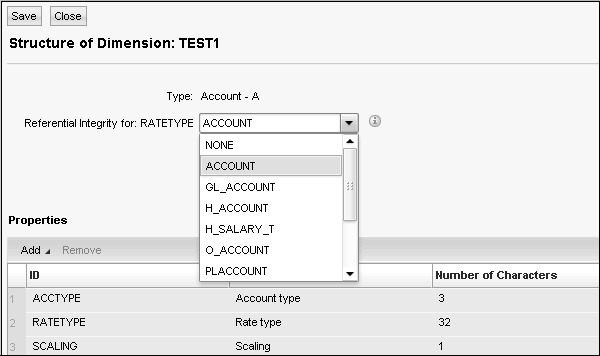 You can also edit structure, edit members, delete or copy an existing dimension. To copy a dimension, select an existing dimension and go to Copy. Enter the name of dimension and description. Click ‘Copy’ button. Naming Conventions in Dimensions − You shouldn’t use special characters while naming a dimension, member, and application in BW table. 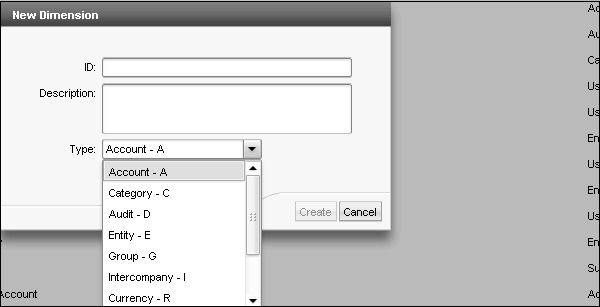 You can create dimension name up to 16 characters and it shouldn’t contain comma, double comma, back slashes, ampersands. However, you can use underscore. You shouldn’t use the following names – App, AppAccess, AvlObject, CategoryAccess, CollabDoc, CollabIcons, CollabRecipient, CollabSupport, CollabType, DBVERSION, Defaults, DesktopStyleDef, Dimension, DrillDef, DTIParam, Function, Formula, Group, InvestParam, MemberAccess, MessageLog, Packages, PageDef, Permission, PublishedBooks, Rate, ReportParam, SectionDef, Status, StatusCode, TaskAccess, User, UserGroup, UserPackages, UserPovDef, WebContents, SOURCE, SIGNEDDATA. Description of dimension shouldn’t be more than 50 characters. You can delete a dimension by selecting it and clicking the ‘Delete’ button. BPC security is managed in Administration console. You have to login to BPC portal and go to Planning and Consolidation Administration. Users − This is used to add users to environment and manage their access rights. Teams − This is not so important and you can define a team of users with the same access rights. Task Profiles − This allows setting up profiles for tasks to be performed and assign them to users and teams. 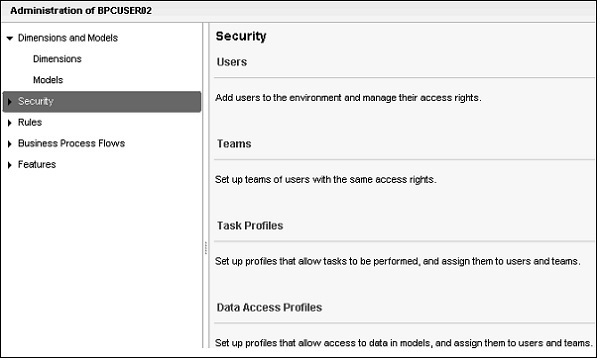 Data Access Profiles − This is used to set up profiles that allow access to data in models and assign them to users and teams. 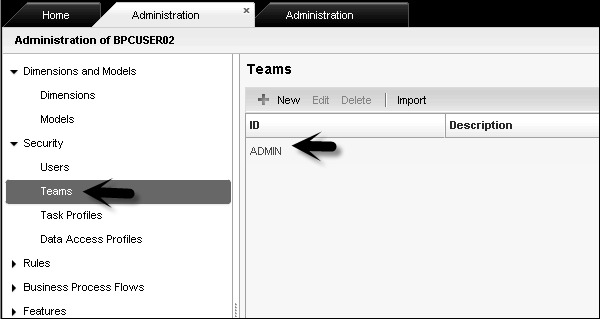 Click ‘Team’ tab under Security, select Admin team and double-click. You will see the details of Team name – ADMIN, which users are part of this team, task profiles, and data access profiles. You can edit the team details and click ‘Save’ icon to apply changes. Going to the user tab, you can add new users, edit existing users, and delete any user.